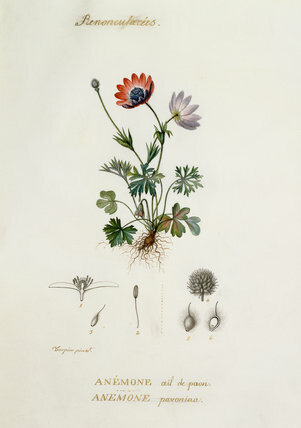 Watercolour on vellum of Anemone plant by Pierre Turpin. This is taken from an album of 25 original drawings of flowers which include un-coloured dissections of the flowers and seeds beneath the main illustration. Examples of Turpin's work were held in the collections of the French and Austrian monarchies.